After 11 games out with a knee injury, Oliver came off the bench during the second half of the weekend’s 1-1 draw with Grimsby Town. He replaced Richie Bennett up front with the game at the Globe Arena still goalless and an hour having been played. Oliver’s arrival on the pitch was greeted by a smattering of boos, although it was unclear whether the disdain was for his return or the decision to withdraw Bennett. Bennett has been a favourite since joining on loan from Carlisle United in January. In contrast, Oliver has been a divisive figure; supporters highlight his work rate and physicality, while critics point to a lack of goals. Either way, the manager was singularly unimpressed by the reaction to his change. He said: “A lot of thought and preparation goes into it; you make a change and you get booed. “I thought that was wrong and how does that make Vadaine Oliver feel? Saturday’s point sees Morecambe 19th in the League Two table going into the Easter double-header against Mansfield Town on Friday and Cheltenham Town on Monday. With four games of the season remaining, the Shrimps are 19th in the table and 10 points clear of the two relegation places. Of the sides beneath them, only third-bottom Macclesfield Town can genuinely be described as a club with a similar size and budget. With that in mind – as well as the long-standing training ground issues, lengthy injury list and worsening playing surface – Bentley feels that he, his staff and the players deserve more than the criticism levelled at them by a section of the Shrimps supporters at the weekend. He said after Saturday’s game: “I think we were 250/1 to go down before today and now we’re going to be in a better position. “That will be our greatest achievement when you think of the things that have been stacked up against us. “I’ll have more to say but I’ll bite my lip; I’m only human and people say I shouldn’t listen to it but you know when you’ve had enough – and I’ve had enough at the minute, I don’t know what more I can do. “The little differences that can go your way haven’t gone our way; I’ve put a lot of time and dedication into it but, when you want a ‘well done’ certain people can’t wait to point the finger at you – it’s laughable but there you go. “I’ll probably be alright when I look at the league table; we want to finish the season strongly and everyone is giving their all for the shirt. “Some of the criticism hurts and it can get under your skin a little bit. “Some of the players have had stick this year and that really disappoints me; we need to get behind everyone, me included. “We’ve given the town a team to be proud of and, against the odds, it looks like we’re going to stay up. 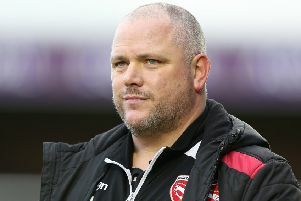 “I have big names texting me, saying we’ve done fantastically well to stay where we are but I get people here saying it’s a fantastic achievement and they’re looking forward to another season at League Two level – but hopefully it’s with a different manager. “It’s the only job where everyone else knows how to do it better than you. “It’s that one per cent who have far too much to say; you see them and they’re nice as pie to you but, in the technical area, you hear what they are saying. “We’ll keep going to the next game and try to have a good Easter period. “I’m disappointed for the fans and players that we didn’t get over the winning line but results have gone our way, it would take an unbelievable occurence of results for us to go down. “Football doesn’t surprise me but, at the moment, I’m surprised.